Quite an amazing annual basket stuffer! In other parts of the world this plant is considered a weed and must be controlled. Ah; I love –30 below zero. The maroon buds of 'Lena' open to dazzling lemony-yellow to orange flowers in late May to June over wispy, grass-like foliage. “Well that’s what the tag says.” We love this annual plant planted into containers because it gives the “full deal” over 12 months. In the spring when first planted Lena Broom has light green upright grass like leaves that stand ridge and stiff. Then, as the spring continues the most amazing colour appears, burnt orange to lemon yellow flowers that continue to appear for about a month. After the flowers are finished the grass like ridged wind resistant stems become the talk of the container. The plant then even shines even more in the fall and winter. The stiff stems hold up under the coldest and snowiest of conditions. It looks great over the Christmas season and will look wonderful until March when you will be ready to buy another in April and start all over again. All round great annual basket stuffer plant. 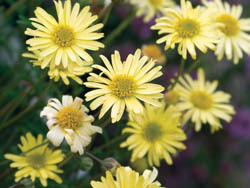 A charming old variety of garden annual that is easily grown in a sunny border. From spring to summer, this annual produces multiple flower spikes with tiny flowers enclosed in showy highly coloured spikes of somewhat petal-like bracts of blue, white, pink or purple and marked with darker veins. 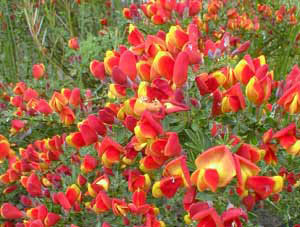 Plants grow about 18 inches and make excellent material for cut flowers that can be dried or used fresh. 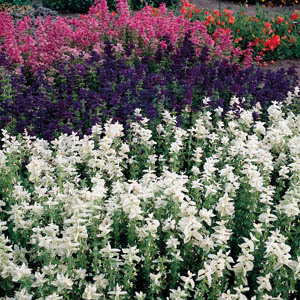 These plants give the best effect when planted in groupings. The name “Clary” is a sweet liquor of a mixture of wine clarified honey and spices. When the plants are planted on mass it must give the impression of this wine-honey mixture. This is a lovely compact plant with attractive fern-like foliage with dime size buttery lemon colour flowers that will appear all summer long. Unlike some Swan River Daisies that have a tendency towards drunken, floppy behaviour this is a beautiful development that is neat with a profusion of blooms. This is the plant for the inadvertently lazy amongst our readers (yes; we know there can’t be that many) just pop this plant into your sunny to filtered light containers and you will look like you have a professional gardener tending to your pots. Pinch off the dead heads once the flowers are over and really that is all the work this plant will take. So here is something different on the Katrina’s Picks list. Yup a vegetable! Golden beets have been around for about 100 years; Touchstone Gold, which was first released in 2008, is one of the best. The most important thing is the entire kitchen will not be stained red with beet juice when you are cooking them, (maybe I am just messy) but mostly the colour is amazing. 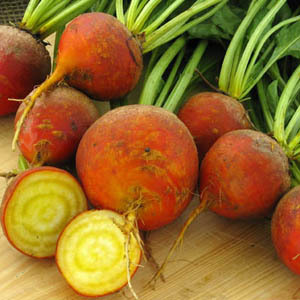 Dark golden flesh with bright white rings makes this beet truly special. The nutritional benefits of all the different varieties of beets are fairly similar as they are all high in iron, potassium, foliate, and vitamin C. Touchstone has very sweet tangy flesh and can be pickled, eaten cold or hot and is a really yummy pick for 2013. A striking coprosma with stand out chocolate brown to plum red, very shiny fleshy foliage which contrasts with the lime green new growth. This is an essential patio container plant that adds a splash of leaf colour and texture; one look at the leaves and you will know why this New Zealand native is called the Mirror Plant. 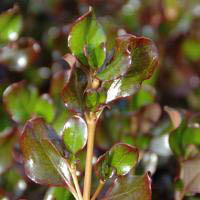 Plum Hussy Coprosma is among the most textural and versatile annual plants that we sell, to be put into containers. They love to grow in hot sun, but will tolerate a filtered light condition. The foliage colours also darken and intensify in cool weather. Try mixing this plant with annual grass like the Carex Cappuccino or Surfina Sky Blue Petunias. Just outstanding!! Just when you thought petunias couldn’t get any better, along came the Martha Washington Petunia. (Ok; so many of you don’t like petunias, but at least let me make my case). 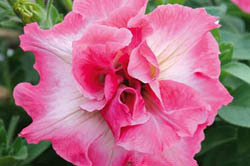 This petunia features a double bloom of deep pink with a pale rose throat and a deep pink “bud” in the centre. The "Martha Washington" petunia is ideal for adding bright colour to the deck or patio container, but does not trail like the wave petunia. Instead, this petunia creates a 12-inch mound that spreads to 16 inches, making it ideal to tuck into small corners. Like other petunias Martha Washington would like to grow in full sun but will tolerate growing in filtered light. Plants are both neat and prolific, and best displayed where the overall effect of a plant in full flower can be appreciated while at the same time the intriguing detail of individual blooms can be seen in close-up.